I made these gorgeous potatoes for a Greek inspired dinner party this past weekend. They were delicious! Roasting the potatoes filled the kitchen with the heady aroma of garlic and herbs. Trust me, you'll be making these often. Enjoy! 1. Preheat oven to 425 F. Grease a large shallow baking sheet. You might need a second baking sheet to get the potatoes in a single layer. 2. Cut the potatoes into wedges and place in a large mixing bowl. 3. Combine the onion, herbs, garlic, lemon juice and olive oil. Add the herb mixture to the potatoes and mix until the potatoes are well coated. Layer the potatoes on the baking sheet(s) in a single layer. 4. Add the chicken around the potatoes. Sprinkle the potatoes generously with salt and pepper. 5. Bake for 50-60 minutes until the potatoes are golden. Turn them often so they don't stick to the baking sheet. Now am I not only craving these gorgeous potatoes, I am craving greek salad. These look delicious and I may pair them with the chicken dish I am making tomorrow. Thanks for the idea. Yum! Those potatoes look wonderful with lemon and herbs! 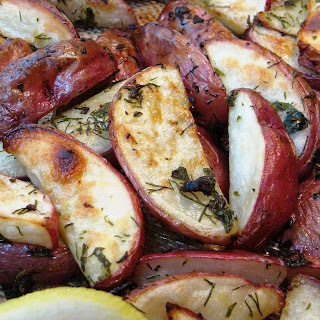 I love these roasted potatoes and yours look fantastic! Nothing will beat a simple roasted potatoes, they are delicious just the it is, but add lemon will make it irresistible. Such a simple dish that's oh-so-good! Had me some roasted Greek potatoes last night meself...a standard for holiday or Sunday dinners...the herb combo sounds delish. These potatoes couldn't look better if they were resting atop a naked supermodel. Yay, you! I've made something with almost exactly the same flavours, but I skewered the potatoes and put them on the grill. Very tasty! Your potatoes look great love all the herbs. Tasty thanks for sharing. Mmmm, fresh dill over the potatoes? Count me in! These look SO good and I wanna bite! Bravo! I bet your friends ate them up! 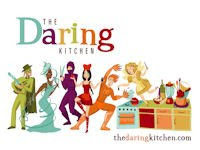 Your potatoes look divine! I will be making them tonight with chicken kebab! My honey pot is from Fortunoff but I bet you can find it on Ebay. They look wonderful. I love dill with red potatoes and lemon!!! Oh, yum. Your potatoes look and sound amazing. that is THE way to eat roasted potatoes! These look amazing! Cant wait to try this out. 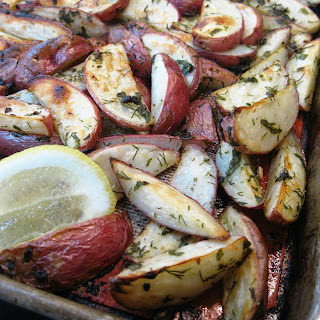 Love roasted potatoes - I bet they're delicious with the dill! Just the sight of all those herbs lets me know how delicious these were! Those potatoes look great, and with all those herbs they have to be so flavorful and irresistable! I love roasted potatoes and these look so super flavorful and fresh - yum! Oh yummy! Just the side dish to go with a Sunday roast. I love roasted red potatoes and like very much the combination of parsley, dill and oregano that you've used. Sounds like a winner to me. These look soooo delicious! I love potatoes, but have not ever tried Greek food before. what a great combo of flavors! I would eat this for a meal in itself! Those look delicious! I'm always looking for new ways to make potatoes. I will definately keep these in mind. How funny... I made these exact same potatoes for my Greek Dinner party! Arent' they yummy?? What else did you serve? I make something just like this...red potatoes are excellent baked, aren't they? This is the best way to prepare potatoes! YUUUUM! And nice and simple to make, too! Mmm Dill and potatoes. Sounds fantastic with all those fresh herbs.